A few years after the Village of Kenmore was incorporated, the village was looking to become independent from the City of Buffalo and on May 19th 1903 a public hearing was held in the Sunday school classroom of the Presbyterian church. As part of that meeting, the Kenmore Fire Department was organized. They named Myron A. Phelps the first President and Frank C. Stillwell as the first Chief. On May 25th 1903, the Village Board approved the incorporation of the Kenmore Fire Department and also approved a special assessment to be made for fire protection on all premises where water was not used from the Kenmore water system or not situated within 500 feet of a water hydrant. On July 1st 1903, men of the north end of the village met and voted to elect officers of a hose company, named the Alert House Company #2. John I. Keller served as the first President. The following day on July 2nd, a meeting was called for the purpose of electing officers for a fire company by the men of south Kenmore and north Buffalo. The Delaware Hose Company #1 was formed with Freelon Hunter as President. 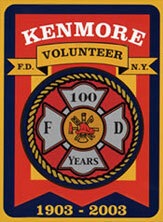 A hook and ladder company was formed shortly after that in 1905, named the Kenmore Hook and Ladder company. A shortly lived Kenmore Chemical Engine Company existed from 1911 to 1919 as well. Members of the newly formed fire companies lived in north Buffalo, Kenmore, and in the Town of Tonawanda. The men of the companies had a wide variety of occupations, including farmers, carpenters, brick layers and salesmen. In November of 1920, the Delaware Hose and Kenmore Hook and Ladder companies consolidated and the new company was named Delaware Hook and Ladder Company. For the next 62 years, the Village of Kenmore was proudly served by both the Alert Hose Company and the Delaware Hook and Ladder Company until the two companies decided to consolidate in March of 1982, forming the Kenmore Volunteer Fire Department, as it is known today. In the days before the village has a fire hall, the hand drawn carts were kept in farmers’ barns on the west and east side of the village. In 1903, a Village and Fire Hall was constructed at 2831 Delaware Avenue, just south of Warner Avenue. In 1910, the Village Hall moved to its current location and the old fire hall was only occupied by the fire department. In 1919, the Kenmore Police Department was formed and shared the space at the old Delaware Avenue fire hall. The Kenmore Fire Department has used many different firefighting apparatuses over the years. Early equipment used by the Delaware Hose and Alert Hose Companies consisted of hand drawn horse carts with a hose reel holding approximately 300 feet of hose and some firematic tools, including a fireman’s axe, crow bar, kerosene lanterns, tool box, hydrant wrench, and spanner wrenches. The Chemical Engine Company owned a two wheeled hand drawn cart with hose and chemicals. In December of 1918, the first piece of motorized equipment was purchased. It was a 1 ½ ton combination chemical and hose truck. The “Atterbury” later had a 350 gallon pump installed on it in 1922. The fire and police department began to run out of room at the old hall as they grew and as the village grew in size. On April 21st 1929, the cornerstone was laid at the site of the construction of a new fire and police hall. On September 7th of that year, a public dedication was held with an open house, inspection of the new building, and a grand parade was held. The Kenmore Police Department moved in 1951 to their own building on Elmwood Avenue. An addition was built on to the existing hall in 1967 and in 1983, a vacant building next to the hall was demolished and a parking lot of constructed for use by the fire department. The first fire alarm system in the Village of Kenmore, was the church bell of the Methodist church. They would ring the bell fast to indicate a fire alarm. In 1904, the village purchased a bell that was used until 1917 at the old fire hall. In 1917, an electric fire alarm system. The new system included ten fire alarm boxes installed around the village, and a siren and punch type register went into use at the fire hall. When an alarm box was pulled, it would activate the fire siren, and a gong at the hall would clang out the box number. The old fire bell was removed from the fire hall tower. The bell from the old Delaware Avenue Fire Hall is now on display at its final resting place in front of the Nash Road Fire Hall. In 1927, the single siren was replace with a double siren so it could be better heard, and the single horn was moved to the village water tank to help alert members on the west side. In 1934, a blast system was added and then used in conjunction with the current sirens. The blast system was used, with the air horns on the fire hall roof, until March of 1981, when it was retired after 47 years of service. In 1955, the Erie County Fire radio system went into operation, and the Kenmore Fire hall was the Tonawanda base station, Shortly after that, home radio receivers and fire gear for the fire fighters were purchased since firefighters were so quick to respond to calls from their homes using this new technology. In 1981, the Town of Tonawanda Fire Alarm Office began receiving and dispatching all Kenmore emergency calls and the Erie County Fire Radio station base was moved out of the hall and into the new location. To help save costs and reduce the number of false alarms, the Village gradually removed street fire alarm boxes from the service. In 1989, Motorola miniature portable alerting receivers were purchased, so each active member would be in constant contact for emergency calls at all times. In 1994, after 77 years of use, the siren on the roof of the fire hall was removed. Now members rely entirely on the portable receivers to receive the call for duty. The Village of Kenmore has seen its share of major fires through the years and the members of the Kenmore Volunteer Fire Department have always answered the call of duty. In August of 1916, The Elite Theater on East Hazeltine was destroyed in a fire, but the Presbyterian church next door and adjoining houses were saved. The fire had started on the theater stage in the rear of the building and flames spread to the outside with such force that residents in the immediate area panicked and prepared to save their household goods. Buffalo fire trucks were called by concerned neighbors, and they arrived after the fire was brought under control by the Kenmore firemen with their hand drawn carts. The KVFD experienced its first large, destructive fire on February 25th 1927 when the Kenmore Theater Building’s southern portion, on Delaware Avenue between Chapel and Landers, was almost completely destroyed resulting in a $125,000 loss. Kenmore firefighters assisted with mutual aid from Buffalo, Ellwood, and Kenilworth Fire Departments, and worked for 7 hours to subdue the flames. This would be the first of three major fires over the course of the next 40 years. On November 12th 1929 the Arms and Bronson Department store located at 2929 Delaware Ave, which was just behind the current day Municipal Building, had burned down. There was $40,000.00 in damages. This was an oil-fed fire from a tank in the store basement which destroyed the cellar as part of the first floor collapsed. Dense smoke and ammonia fumes made the firefighting even more hazardous. One second floor resident had to be rescued by ladder as another escaped before the smoke filled the building. Around 8:30pm on October 8th 1937, huge pieces of concrete and metal were hurled through the air and blown into the mill yard at Eastern States Milling on Military Rd. and Ontario St., when a terrific grain dust explosion blew out several upper floors at the 11-story industrial complex. Flames shot 100 feet from the top of the building and steel girders were twisted like match sticks. One worker was rescued from possible death by Howard Evans, a KVFD member, who arrived first on the scene before the apparatus and heard a man was trapped on the 10th floor. Evans went up the winding stairway with a borrowed flashlight, found the victim, then brought the him down to safety. Firemen worked at the scene for 3 ½ hours. On November 25th 1947, the north portion of the two story brick Kenmore Theater Building on Delaware Ave was lost during a $300,000 fire. The five stores and the bowling alley were destroyed, and eigh other businesses suffered smoke and water damage. Firemen were on the scene for 9 ½ hours and Buffalo and Town fire companies assisted as Buffalo crews pumped water into Kenmore water mains to raise the water pressure. At 12:20am on February 14th 1955, The Royal Host Restaurant and seven other stores on Delaware Ave at Liston were destroyed in a $250,000 fire. Town fire companies aided Kenmore for the six hour two alarm fire while dealing with sub-freezing temperatures. The fire apparently started in the rear of a drug store and spread to the rest of the block through a false ceiling. On August 5th 1959, Kenmore assisted Town firemen at a spectacular two alarm blaze that was pierced by at least 50 explosions at the Liberty Motor Freight Line trucks terminal on Military Rd. north of Woodward Ave. in the Sheridan Park Fire District. The series of explosions from the barrels of nitrocellulose lit up the night sky with balls of fire and thick black smoke, hurling metallic debris over the area. Sixteen tractor trailers were destroyed along with a portion of the terminal in the $750,000 fire. The infamous “Ebb Tide Restaurant Fire” took place on December 11th 1965 at approximately 9:15am. Heavy black smoke swept through five business places on Delaware Ave. at Euclid. It started in Caruso’s Shoe Repair, and then spread through false ceilings to Shaw’s Textiles and the Ebb Tide Restaurant. Town firemen assisted during this two-alarmer. The fire was caused by careless smoking in the shoe repair shop when rubber cement and other materials became ignited. Flames were shooting out of the front door of the shop when the first crew arrived on the scene. The smoke was so thick it hindered the visibility at the scene. One of the worst fires in Kenmore’s history was the third major fire in the old Kenmore Theater Building, on March 20th 1968. The theater had been remodeled by this point in time and called Kenmore Plaza Apartments. The complex contained 51 apartments and three store fronts. A raging fire destroyed most of the two-story brick complex. Two tenants lost their lives during this two-alarm fire. Flames broke through the ceiling around 1:00am and began to engulf the southern end of the building. The fire was not declared under control until 5:30am. The exact cause was never determined, but it appears to have started in the rear of a first floor laundry room. Smoke was so thick when firemen first arrived that our men were kept busy rescuing residents who were unable to use the fire escapes or stairways. Victims were pulled through windows and led down fire department ladders to safety from the smoke and flames. Following this fire, the entire block was torn down and a new apartment complex was in its place. On March 22nd 1973, Penny’s Hardware at Elmwood and Wabash was destroyed during a two-alarm fire. Fire traveled fast through a false ceiling and caused thick smoke conditions which made operations on the scene difficult. During the height of the blaze, the roof had collapsed in a shower of burning embers. On a snowy Sunday afternoon on November 27th 1977, KVFD Lt. Michael Coffey fought heat and heavy smoke to rescue an unconscious 76 year old woman from the second story as a blaze ravaged through her home at 289 Kinsey Ave. Upon arrival at the scene, firefighter found the home fully charged with thick black smoke rolling out of every door and window forcing the crew to use air packs in search of the woman. Lt. Coffey was the recipient of “Fireman of the Year” award from Firematic organizations and received numerous citations from various service clubs and the Village of Kenmore for his heroism. On July 3rd 1988, a spectacular fire and explosions in District 1 rocked Polymer Applications, a chemical plant on River Road, causing approximately $6 million in damage. It took over 150 firefighters from Kenmore, Tonawanda, and many neighboring departments 9 hours to bring the fire under control. Crews were on scene through the July 4th Holiday. The Town of Tonawanda Highway Garage on Woodward Ave. was destroyed on July 13th 1995 in a $7 million dollar 3-alarm fire that included about $4 million in trucks and equipment. This was one of the most costly fires in town history. The fire burned out of control for hours with thick black smoke and flames. On May 5th of 1997, a 3-alarm fire destroyed the Caton Hendler Paint Company at 2429 Elmwood Ave. and Victoria Blvd. Damage was estimated at 1.1 million. The fire started in a storage room of the store and spread to the rest of the building. An explosion and wall collapsed shortly after the fire departments arrival, seriously injuring five of our members in a shower of flying bricks and concrete blocks. The whole village was covered with smoke and charred particles. Crews remained working at the scene for several hours. The exact cause has never been officially determined. On May 24th, Firefighter Timothy Goff, died from his injuries sustained at the fire. Late in the evening on February 4th 2003, we received a call of a house fire and the possibility of people trapped at 170 Somerton Ave. Crews arrived on scene to find a woman leaning out of a second story window, gasping for air and informing us that her young daughter was still trapped in the house. As our members entered the house, they found the young girl unconscious behind the front door. She was immediately removed from the structure and transported to the hospital. Through heavy smoke and fire conditions, our members worked their way upstairs and rescued the woman in a front bedroom (who had gone unconscious) to safety. Due to the quick action by our members, the mother and daughter (in spite of critical injuries and burns) survived and are alive today. In recognition of this heroic team effort, all members at this fire were honored with the “Fire Fighter of the Year” award. On December 24th of 2009, the KVFD along with the other town companies battled a two-alarm fire at a house on the corner of Military Rd. and Hamilton Blvd. Fire broke out in the basement around 11am and was spotted by a utility worker who was working at that house. The fire quickly spread to the first and second floors. Eleven people, (seven children and four adults) lived in the house and all were able to get out of the house with help from their neighbors and the utility worker. Damages were estimated at $175,000.